← Teaching creatively or teaching for creativity? children (and teachers) thinking across subjects and not keeping them in separate boxes. These aren’t that bad I suppose. The thing is, is you ask children straight they often tell you what they think is acceptable, or repeat what their mates say. Just asking outright may work with some year 5’s and 6’s, though I still don’t think it’s ideal, but year 1’s or reception will have a hard time with that. Here’s the alternative, the much more exciting for everyone, even you, alternative. When the children are in creative flow and talking about the things they have made, shared their ideas and inventions, THAT is when you will know what they are fascinated by underneath the TV programmes and computer games. It might take a couple of session before you can really pick a theme, but it will be worth the wait, because the conclusion you reach will be far more engaging and dynamic than anything you would have come up with yourself. A year 1 class. I show them how to make a simple bendy paper shape I call a ‘bendy beast’ Once they have made the template, the can bend it to make it into bracelets, hats, flowers, or keep it straight and make a snake, a bridge……..almost anything. 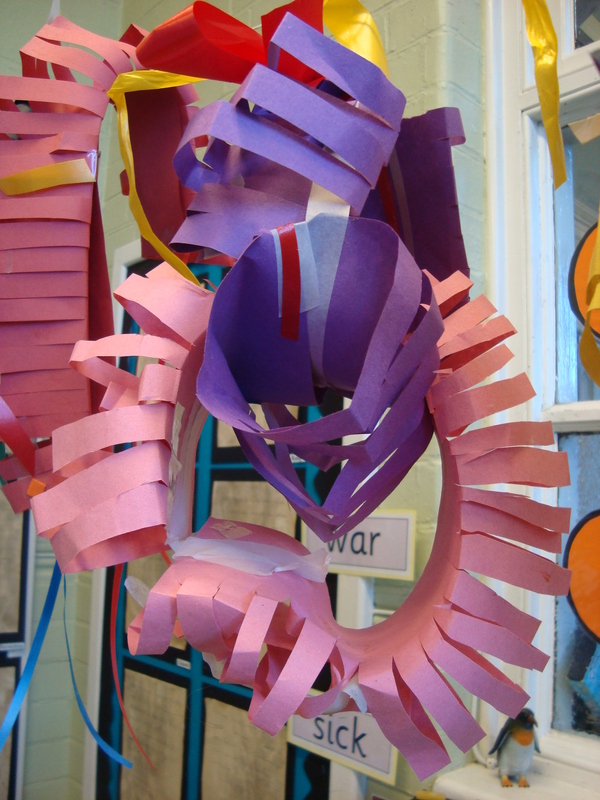 They loved making these and then one child mentioned that they were like Slinkies – the metal coil spring toy that walks down stairs by itself. The name Slinky spread through the class and in feedback time they all called their inventions ‘Slinkies’. ‘My slinky was found on a boat going to Africa’ ‘My slinky has gone out of control, I think it needs a brain’ etc. After one session , we didn’t feel ready to set the theme; we weren’t sure if they just liked the name, or if they really were fascinated by the idea of slinkies. For the next session, we did some more making, but without any guidance, they just made whatever they wanted. The Slinky idea was still strong and they made all kinds of homes and vehicles for the slinkies they had made the session before. So, now we are clearer, we can definitely build on the slinky idea. I am taking in some metal slinkies next time and we are going to sit and plan some exciting starting point for the next weeks work. ‘Animals’ was the original theme for the term, but now we can find out what animals look like slinkies, where do they live, how are they like slinkies? We’ve got creative writing, we can weave maths into it and we want to do some outdoor work cos some of the children were imagining what would happen if their slinky was lost in the woods at the edge of the school grounds. And we aren’t even going to have to talk to the children about a ‘theme’ as such, they are completely fired up about their slinkies and want to do work about them. The theme is more powerful because it came out of the children, it’s in the moment and dynamic. The teachers have to think a bit more but the children are doing much of the thinking too, which is the whole point. 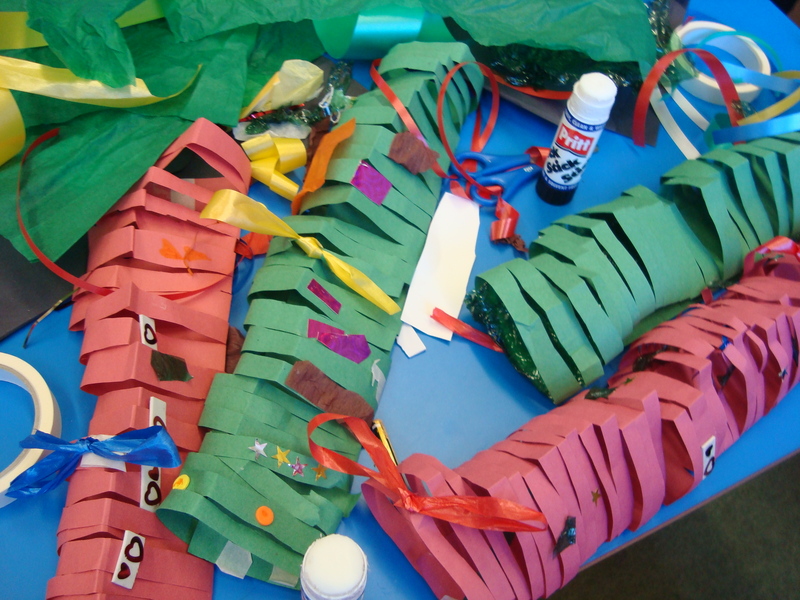 This entry was posted in Creativity, Planning, Schools, Themes and tagged Bendy Beasts, Choosing, Creative thinking, Education, Planning, Themes. Bookmark the permalink.